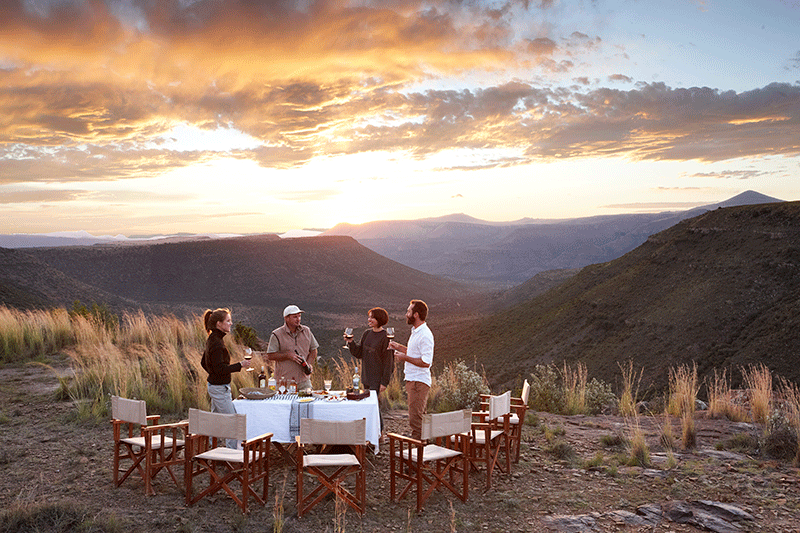 Resting at the foot of the majestic Sneeuberg Mountain Range in South Africa’s dynamic Karoo region, Mount Camdeboo offers a private, malaria-free safari experience in a pristine 14 000-hectare setting. The reserve is home to white rhino, Cape buffalo, cheetah, giraffe, mountain zebra, a host of antelope and an abundance of birds. The on-site spa and constantly evolving menu of wholesome, locally inspired, refined cuisine does wonders for body and soul. Accommodation is in three beautifully restored, gracious gabled manors, each with spacious gardens and swimming pools. For those looking for something under canvas, two luxurious safari tents provide sweeping views over the reserve. Activities on the reserve range from game drives and guided bush walks to cheetah tracking, scenic helicopter flights and star gazing. Informative talks take place at actual historical sites on the property. The airstrip in Graaff-Reinet services daily scheduled flights to and from Plettenberg Bay as well as charters from any major city in the country. Visit to a historic Anglo Boer War site during a normal game drive, where the pivotal “Battle of Paardefontein” was fought. It is here that the famous Boer Commander Johannes Lotter was finally captured. 14 000 hectares of pristine, private land cupped in the palm of the majestic Sneeuberg Mountain Range, offering a truly personalised safari in a region steeped in history and culture. A Great Karoo safari experience offering a diversity of topography and dramatic landscapes, from lush valleys to sweeping plateaus, with an altitude range of 8 000 feet. A diversity of wildlife and flora including threatened and endangered species such as cheetah, white rhino, Cape mountain zebra, black wildebeest and birds of prey, as well as other species such as the cape buffalo, giraffe, aardvark, aardwolf, bat-eared foxes and a host of antelope species (sable, blesbuck, eland, oryx, red hartebeest, springbuck, mountain reedbuck and more). Accommodating a maximum of 28 guests across 3 manor houses and 2 luxury safari tents, ensuring sensitive and sustainable utilisation of natural resources as a foundation for eco-tourism and wildlife conservation. A diversity of accommodation options, suited to families (a sole-use villa), couples, the adventurous as well as those seeking life’s little luxuries. Family owned and managed, with a passion for conservation and community development.